Official artwork of Flage from Uprising. Flage (フラージ, Flage) is an enemy from Kid Icarus: Uprising. 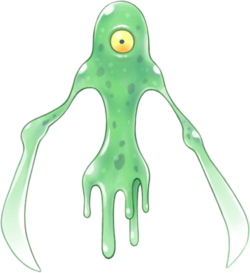 It resembles a gelatinous mass with one eye and blades on its hands, similar to Shaydas. Flage Idol from Kid Icarus: Uprising. Flages in Kid Icarus: Uprising are Forces of Nature enemies that are described as "Covert-ops" specialists. They often move around invisible, the only indication of their presence being a slight green fog. However, they do expose themselves in order to attack. A Flage in Smash Run. Flages appear as enemies. They are normally invisible, their presence denoted only by their shadow, but when close enough to the player they materialize and start attacking with a flurry of slashes, becoming also vulnerable to attacks. This page was last edited on November 13, 2018, at 16:05.